When I first bought my property, I was faced with the daunting task of mowing 3 plus acres of lawn every week. At my last house in the suburbs, I had maybe a tenth of an acre to tend, and that still took over an hour a week. I was not looking forward to my new duties. I know the title may seem a little misleading with the temperature outside FALLing. Fine. Here’s a picture of a tractor. This is about a simple piece of maintenance that can be easy to overlook. When I first picked up my tractor, things were going fine until a few weeks in. Suddenly while mowing one day, the coolant temp started spiking. I took my time finishing up then parked the tractor. My manuals were still in the mail, so I started to do what I do best. Take something apart. 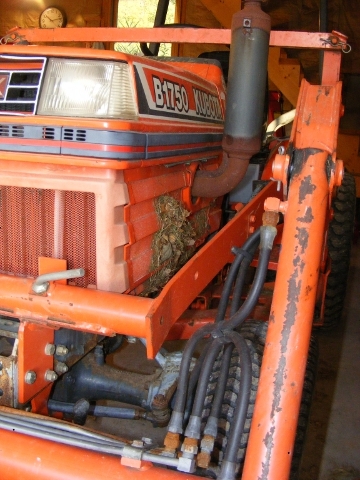 ^ Debris on the side engine shield of my Kubota B1750HST. If you’re like me, you like having fresh herbs on hand for cooking. You can run out to your garden or window box, pluck a few sprigs, and add a splash of color and flavor to just about any dish you prepare. As Fall starts to roll around though, you notice your parsley drooping, your basil getting spotty and yellow, and your thyme slowing to a crawl. Some herbs are perennials, and will be along again in the spring. The basil and parsley though aren’t so lucky. Instead of tossing your window box or hanging basket of herbs into the compost heap you can transplant them into a container. Not only will this provide you with seasonings over the winter, it will add a pleasant scent to the room where you keep them!